Ooh, yeah. This is a rarity in 1980’s Hindi cinema, a masala film that’s complete paisa vasool! It starts off with a bang and continues to entertain thoroughly right up to the end: a rollicking, swashbuckling good time. 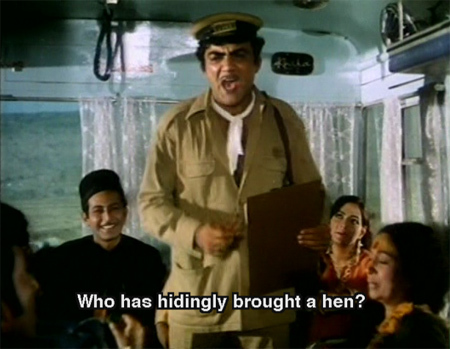 The screenplay was written by Jyoti Swaroop, who is one of those people I’d really like to find out more about, but whose presence on the web is mostly confined to the hilarious film Padosan, which he directed. He’s known to me also for directing the delightful Chorni, and also for writing Satte Pe Satte and Inkaar—two other Memsaab favorites. 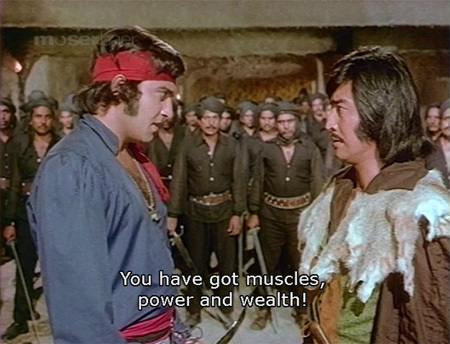 In any case, the fun quotient is greatly enhanced by the droolworthy presence of Vinod Khanna and Danny Denzongpa as bitter rivals who *might* also be long-lost brothers, and by some zany subtitles. I had long ago decided that two or three 1980s-era Hindi disco movies was probably enough for me. But in the interests of a well-rounded filmi education, I needed to see a Kumar Gaurav movie; after all, he is Rajendra Kumar’s son and Sanjay Dutt’s brother-in-law. So I braved this one, and was surprised to find it quite sweet and very watchable. Largely this was thanks to the afore-mentioned star son himself: he is just as cute as a button, making his character one you can really root for. Especially when he suffers under a Ma who really should have thought twice before she brought children into the world and Saeed Jaffrey (love him!) as the villain of the piece. I even actually liked the songs (by Biddu), although Indian disco is not usually my cup of tea.